The last time the beasts of the Mesozoic era descended upon Regent’s Park it was for ‘Dinosaur Zoo’, a puppet-based dino romp that was a lot of fun, albeit somewhat defined by its obstinate refusal to feature dinosaurs that weren’t from Australia (the show was in fact Australian, but dinosaur nationalism is a pretty weird concept). Anyway, ‘Dinosaur World Live’ is a not dissimilar idea, except that the British show, written and directed by Derek Bond, isn’t afraid to give the audience what it wants – that is, a T-rex. In fact, there are two T-rexes, an adult and a baby, plus a brace of Triceratops and some semi-obscure additional dinos (Giraffatitan, Segnosaurus, Microraptor) that parents may or may not have heard of depending upon the extent of their children’s dino-love. There’s a framing plot, which goes on a bit and may sail over the heads of smaller audience members, wherein perky Miranda (Elizabeth Mary Williams, with the squeaky-clean pep of a Butlin’s Redcoat) recounts how her family discovered a mysterious island full of living dinosaurs, which they are now exhibiting across the breadth of the UK in a larksome roadshow. It’s a set-up to introduce us to a succession of lovably unruly puppet dinosaurs, beautifully designed by Max Humphries and manipulated by a versatile team of puppeteers overseen by Laura Cubitt. 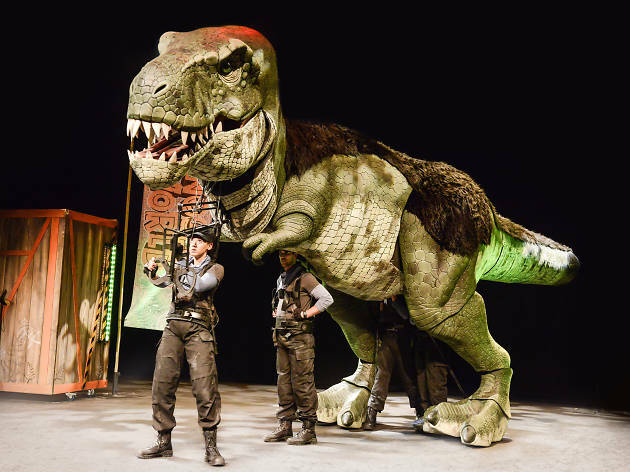 There’s a spot of audience interaction – feeding, grooming – and the noises and movement are convincing enough that a theatreful of tots raised on realistic CGI representations of dinosaurs unimaginable when I was a child appeared to have their disbelief fully suspended. From the perspective of my three-year-old’s attention span, another dinosaur or two would have been ideal, at the expense of some of the chat. And a post-show meet-the-dinosaurs section could have been better stage managed. The baby Triceratops and baby T-rex got chaotically mobbed – though after five or so minutes, Miranda came out to restore some order. It’s undeniably a bit more rickety than some of the more monolithic dinosaur attractions that periodically call in on London, but ‘Dinosaur World Live’ has a genuine, up-close charm and is a perfect child-distractor for the remainder of the summer holidays.